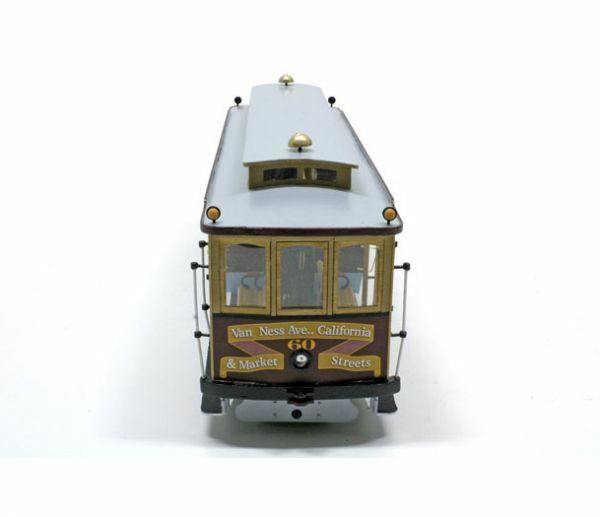 I get a lot of questions about model cable cars. 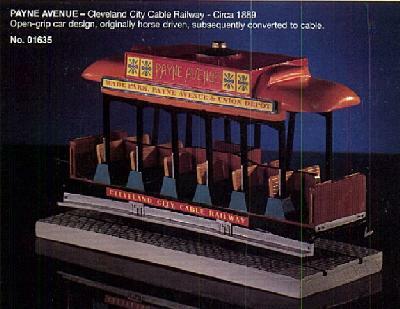 I don't know a lot about model cable cars, but here are some photos people have shared with me over the years. Thank you to the many people who let me use photos of their models. I welcome contributions of other photos. Click on each thumbnail to see a larger version. Use your browser's "Back" button to return. 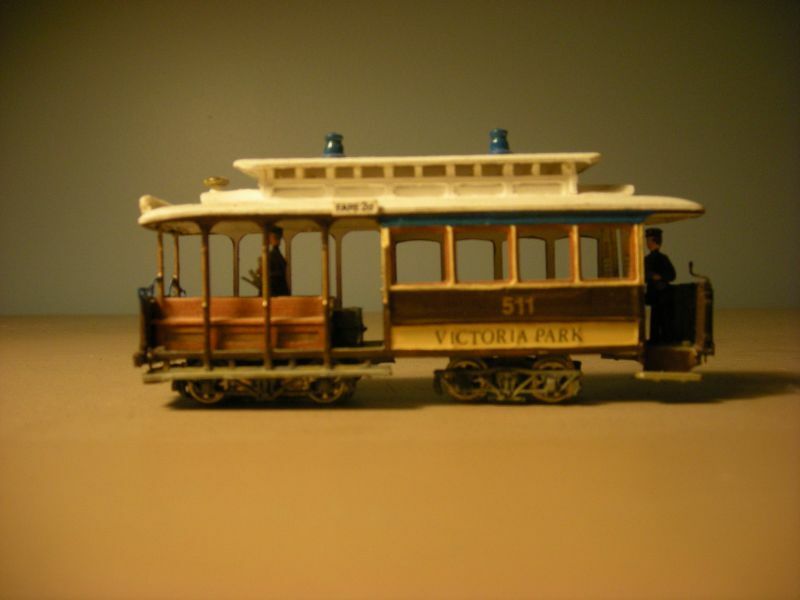 Transit historian Walter Rice had a wonderful collection of transit models. Here are a few examples. 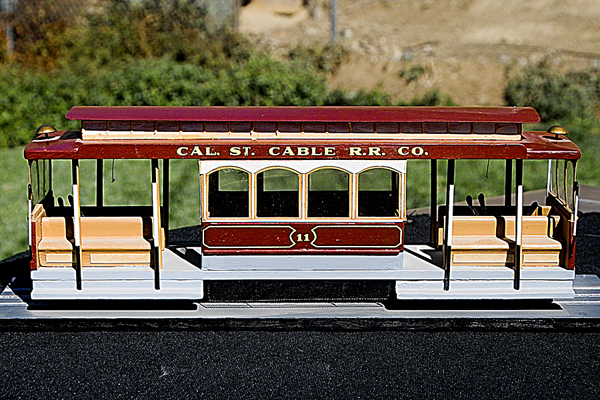 Walter Rice owned this wooden model of California Street Cable Railroad car 11. He said "The kit was a post WWII kit that I spotted at WinterRail several years ago. I remember pushing my past lots of folks as I dashed across the room to get to the table that had it for sale." Walter Rice collection. All rights reserved. A broadside view of Walter Rice's wooden Cal Cable Model. Walter Rice collection. All rights reserved. Walter was a big fan of Saint Petersburg Tram models. 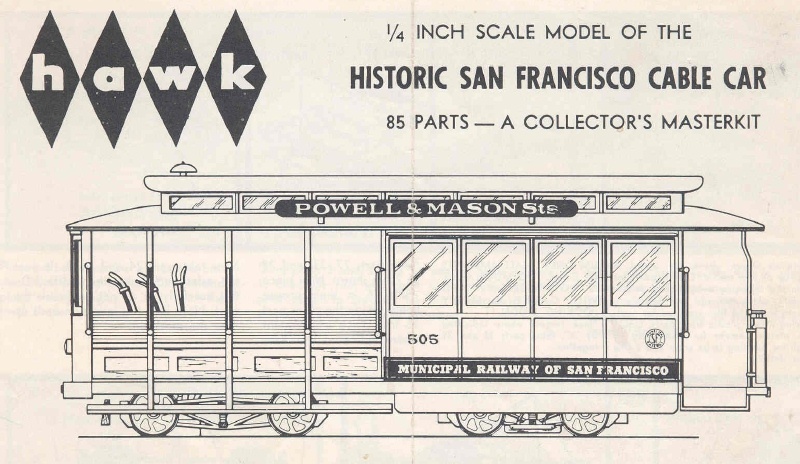 Here is a Pullman Standard PCC painted to represent the Market Street Railway's never-realized 1939 proposal, signed for the 7-Haight & Ocean. Walter Rice collection. All rights reserved. Gripman Val Lupiz has made a series of fascinating paper models. 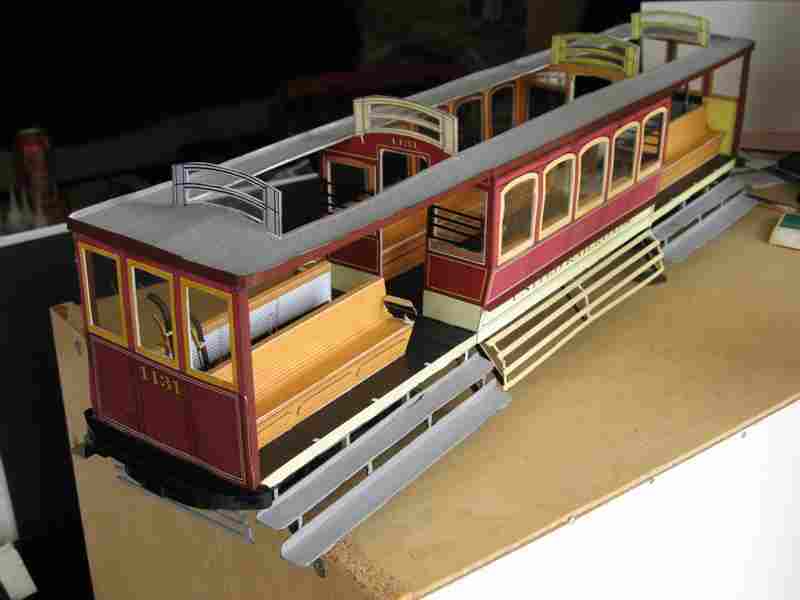 Val Lupiz created a paper model of United Railroads cable car 511. 511 is still in service as Powell Street car 11. The model is about one foot long. Electric car 1131 behind 511 is built to the same scale. Val Lupiz collection. All rights reserved. A front view of the paper model 511. Val Lupiz collection. All rights reserved. 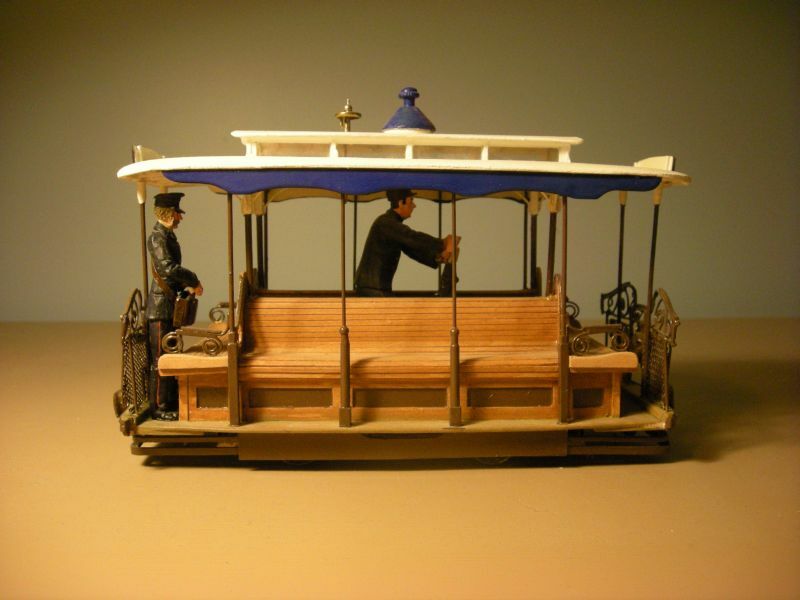 Val Lupiz created a paper model of early Market Street Railway electric car 1213, which had been rebuilt from an Omnibus Railroad & Cable Company. The model, built on a larger scale than 511 and 1131, is over three feet long. Val Lupiz collection. All rights reserved. 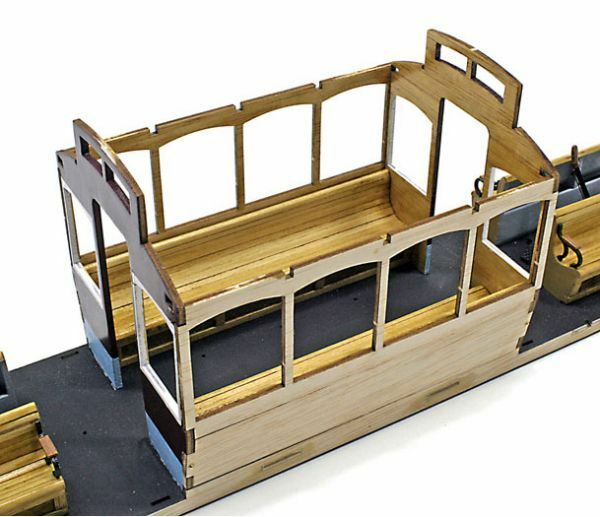 Val Lupiz shows a work in progress, a paper model of early Market Street Railway electric car 1131. Val Lupiz collection. All rights reserved. I recently heard from Jonathan Milne, who grew up in Melbourne and just remembers the cable trams before World War II, but now lives in Canada. I'm very grateful to him for sharing his talent. 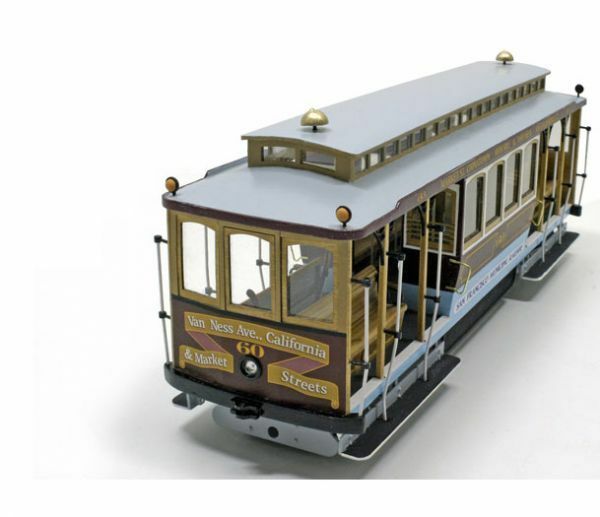 This is "an HO Bachmann San Fran Powell Street model which I kit bashed into what it may have looked like in Melbourne if they had purchased these cars...of course we know that they did not, choosing to remain with the Sutter style set throughout the system’s 55 year history...no turntables needed." All rights reserved. 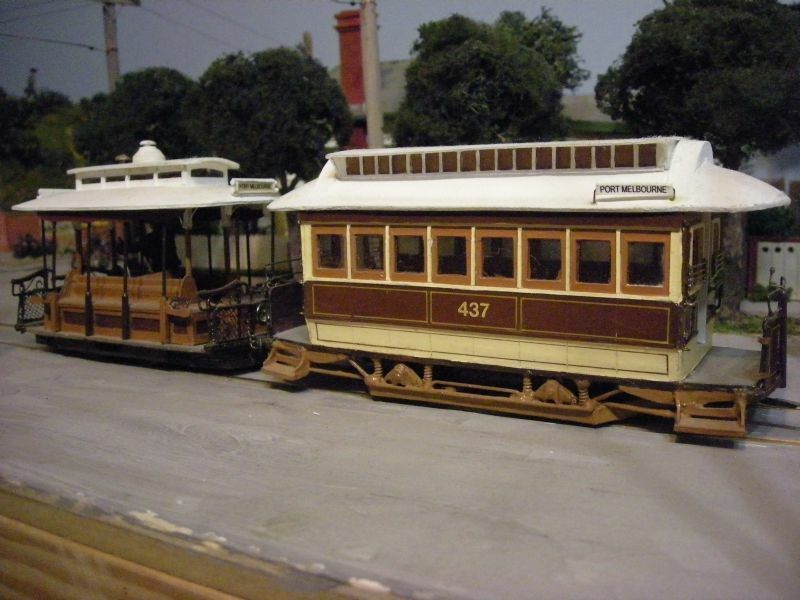 This is a "1.24 scale effort of a Melbourne Dummy... it is motorised and I had every intention of building the eight window car to complete the set but never did so...It now sits along side the O gauge Melbourne set and the kit bashed HO model on a bookshelf." All rights reserved. A broadside view of San Diego cable car Las Flores. Photo by Eleanor Catalina Stevens. All rights reserved. I recently heard from Eleanor Catalina Stevens, who was working on a BA (Hons) in Modelmaking. 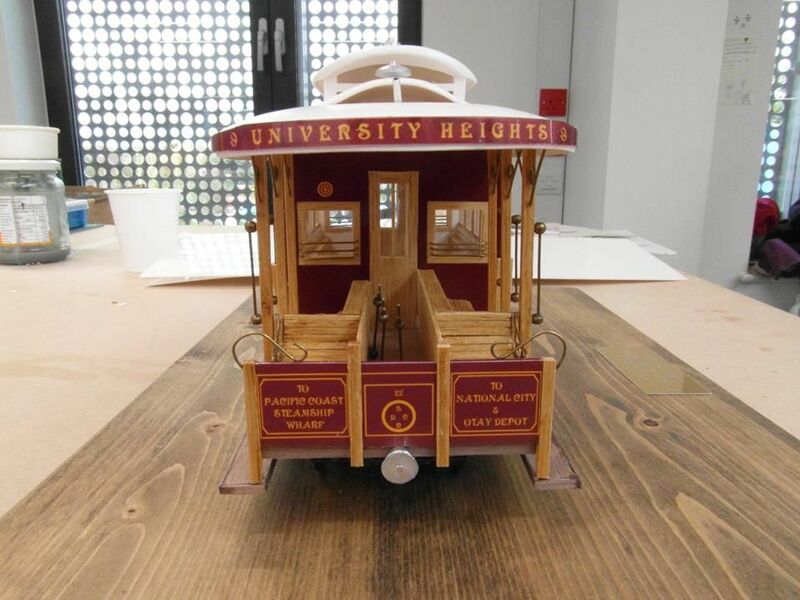 For a project, she chose to build a 1:30 model of a San Diego Cable Railway cable car. I asked her why she picked a project to make a model of a car from a short-lived system a long way from where she lives. She said she picked it because it was the prettiest. Her tutors thought it would be a tricky one. I was able to help her figure out some of the signs on the car. She did a beautiful job. I'm grateful to her for sharing these photos of her work. A head-on view of San Diego cable car Las Flores. Photo by Eleanor Catalina Stevens. All rights reserved. The instructions for the Hawk model. Joe Lacey collection. All rights reserved. Cable Car Division veteran Joe Lacey called the model produced by Hawk in the 1960's "the most accurate cable model I have ever seen." 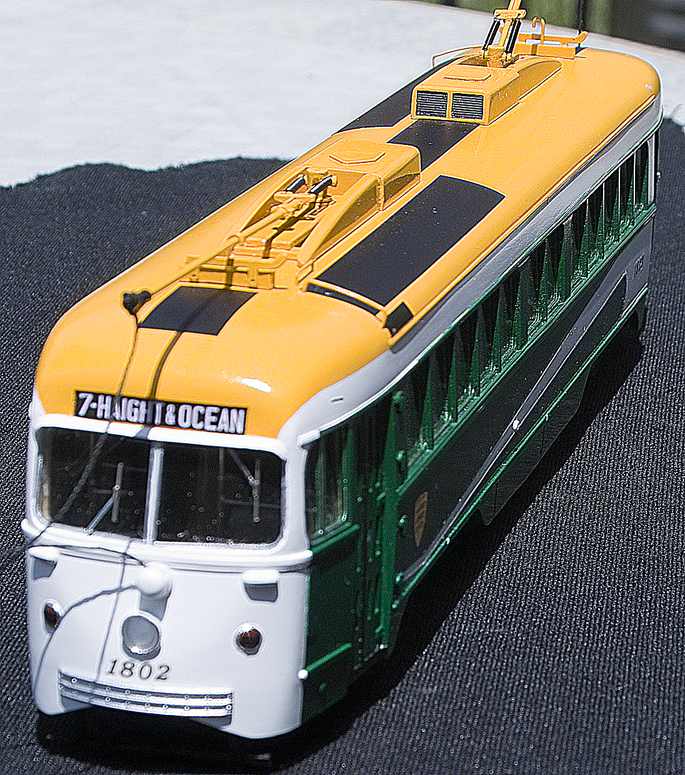 When he assembled the model, he "went to the MUNI paint shop with some jars and got the real deal, and painted the model and several other Muni models as accurate as possible." 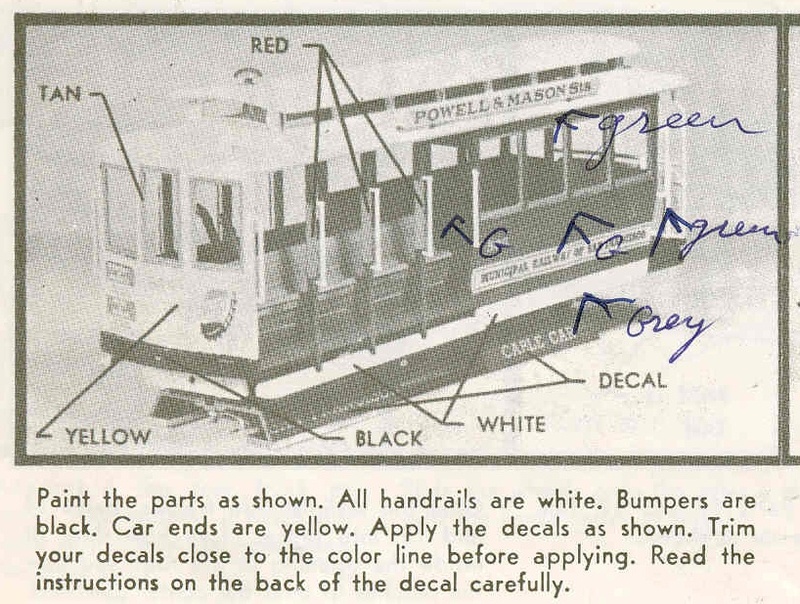 Joe Lacey annotated his copy of the instructions for the Hawk model with the proper colors. Joe Lacey collection. All rights reserved. Gripman Val Lupiz has "three different boxes (Hawk 1950's-60's, Testor's 1970's, and Testor's 1980's) which are all the exact same kit, in different packaging...Same product, different wrapper..."
A friend bashed together the closed ends of two kits and produced a reasonable facsimile of a United Railroads 100-series electric car. Lego(R) bricks and cable cars have always been associated in my mind. I built a small working cable car system using parts of my Lego railroad. I wish I had taken a picture. 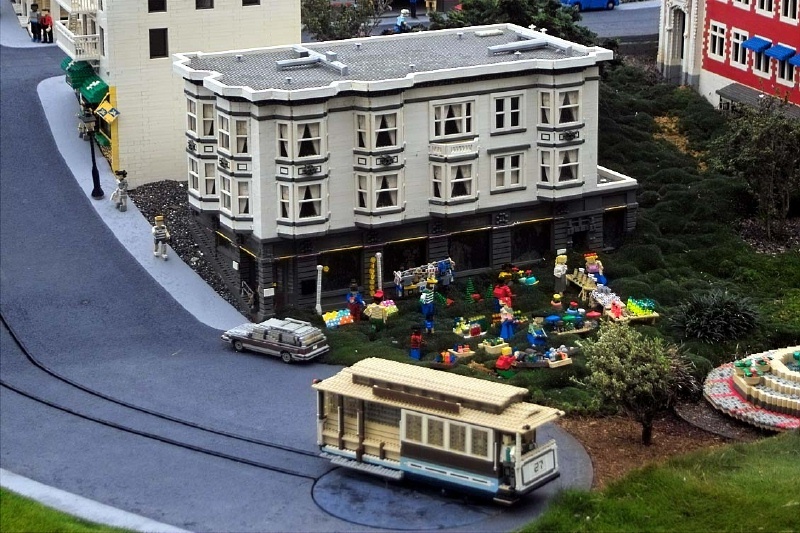 Walter Rice took this photo of car 27 and a tiny Buena Vista Cafe at Legoland in Southern California. Walter Rice collection. All rights reserved. 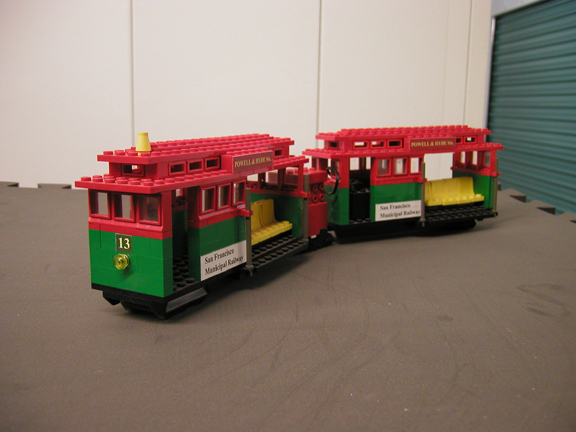 Russell Clark, President and Co-Founder of the San Francisco Bay Area LEGO(R) Users' Group and Train Club, built this model of cable car 13 using Lego bricks on the Lego Monorail system. Visit the group's site to see their wonderful model of the San Francisco waterfront. Russell Clark collection. All rights reserved. 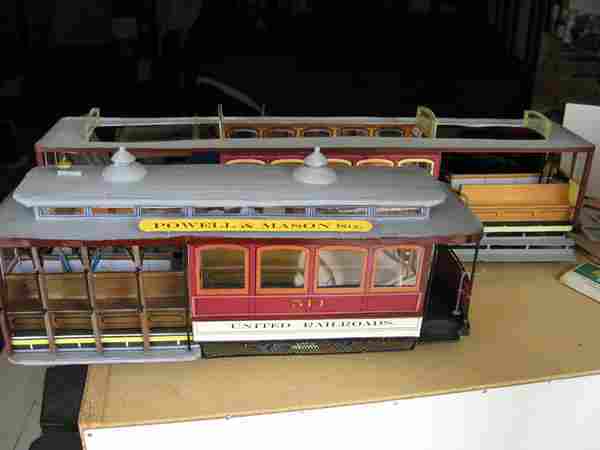 Lefton produced a series of streetcar models, including several cable cars. I don't own any of these, but they look nice. 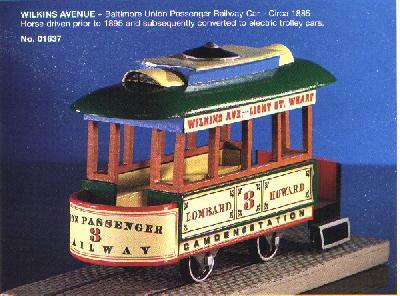 Lefton model of a Baltimore Union Passenger Railway grip car. The gripman stood on the round front platform. 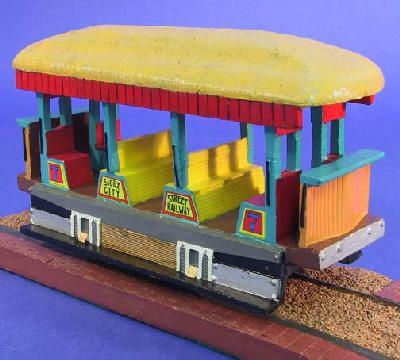 Lefton model of a North Chicago Street Railroad grip car. Note the text about traction "Barren" Charles T Yerkes. 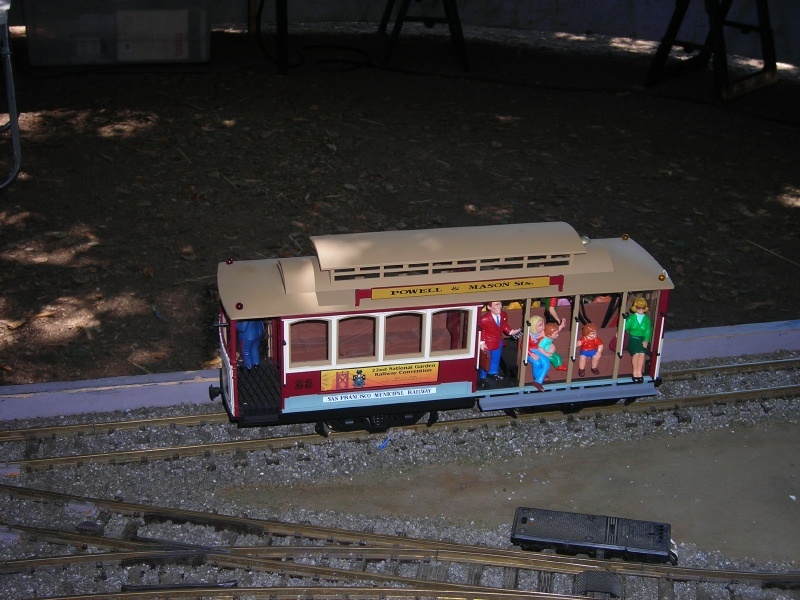 Lefton model of a Cleveland City Cable Railway Payne Avenue grip car. 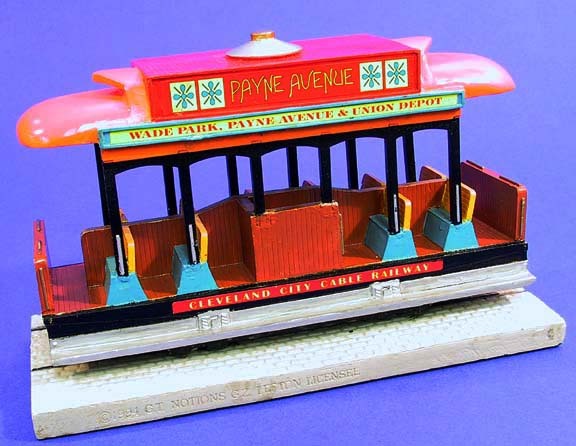 Another view of the Lefton model of a Cleveland City Cable Railway Payne Avenue grip car. January, 2011 Picture of Month. 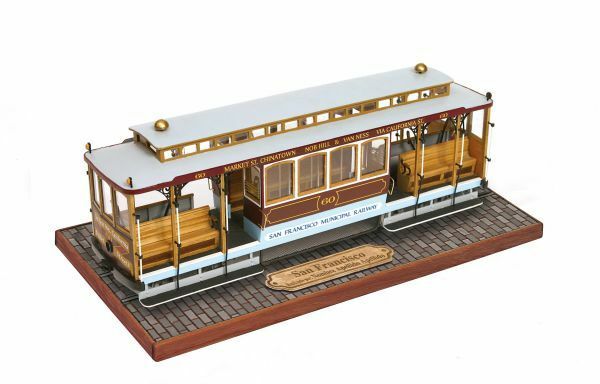 Lefton model of a San Francisco Omnibus Railroad & Cable Company Post Street combination cable car. California Street car 60 by OcCre. All rights reserved. 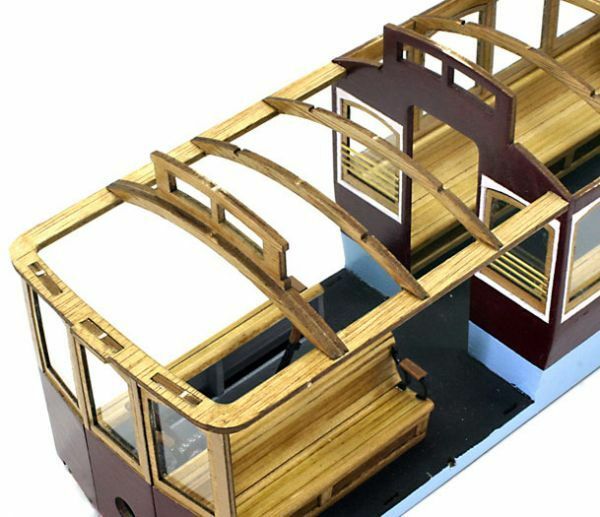 OcCre (Ocio Creativo) is a Spanish company that makes fine models. 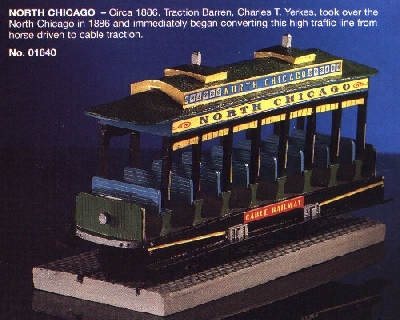 They have a variety of trams, locomotives, and ships. 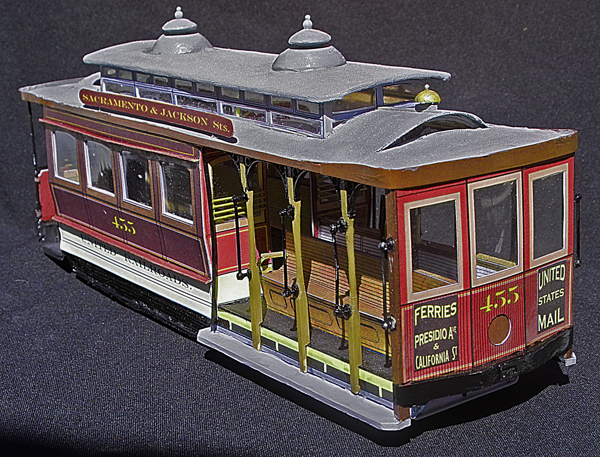 A broadside view of California Street car 60 by OcCre. Thank you to Michael Lampen for pointing out that the signboard says "Market St., Chinatown, Mob Hill and Van Ness Ave. via California St." I checked with OcCre and they said that they noticed this before the car went into production and fixed it. All rights reserved. 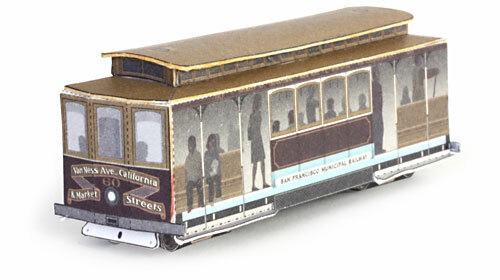 Another view of California Street car 60 by OcCre. All rights reserved. 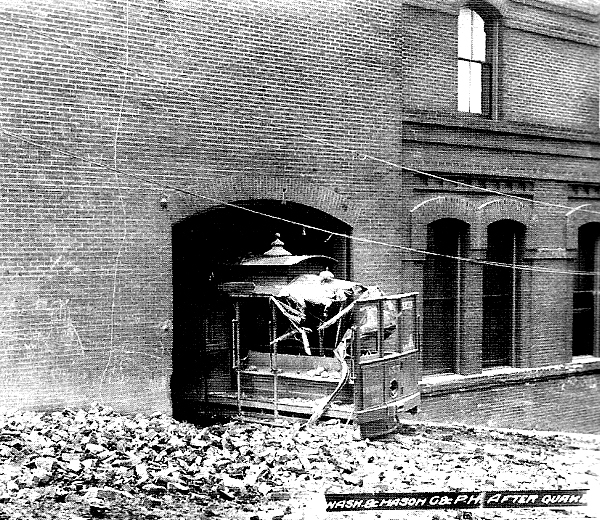 An end view of California Street car 60 by OcCre. All rights reserved. A construction view of the closed section of California Street car 60 by OcCre. All rights reserved. A construction view of the open section of California Street car 60 by OcCre. All rights reserved. 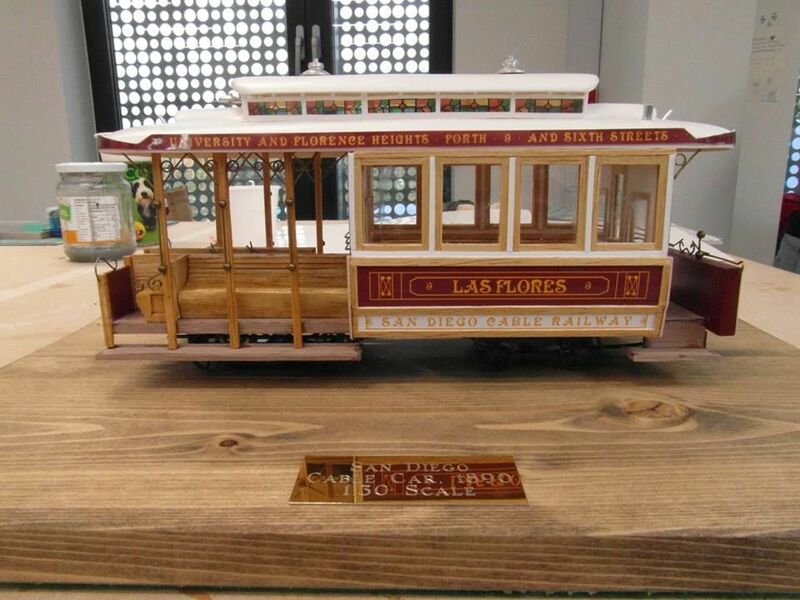 California Street car 60 by OcCre mounted for display. All rights reserved. 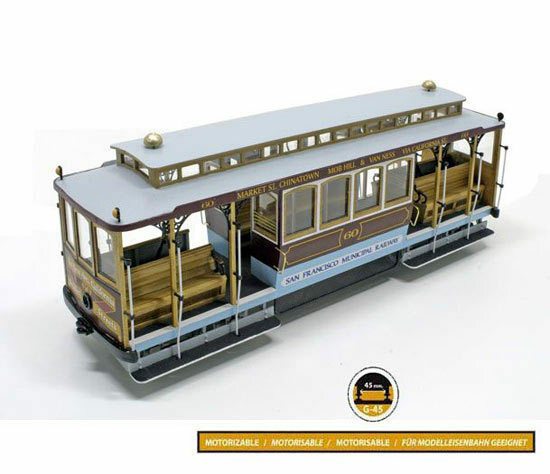 Scale reference for California Street car 60 by OcCre. All rights reserved. 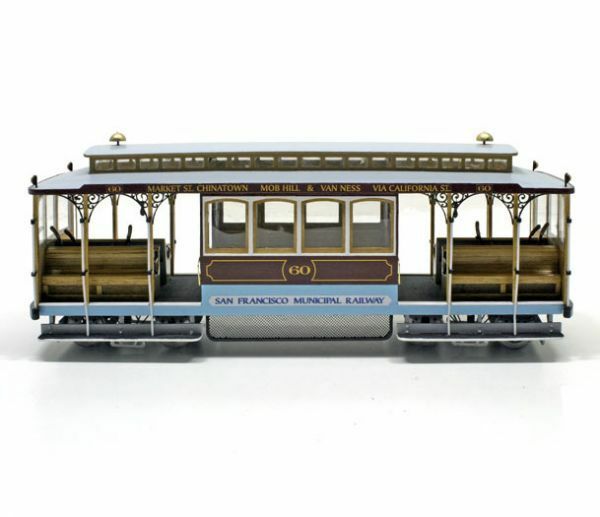 California Street car 60 by Wurlington Bros. All rights reserved. The Wurlington Bros Press produces a series of postcards which can be cut and folded to produce models of landmarks and vehicles. 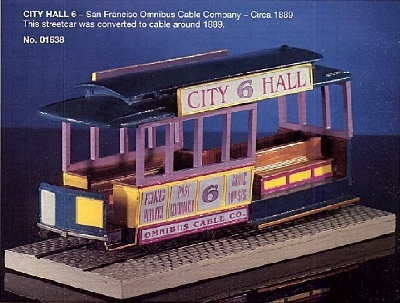 One of their models represents California Street cable car 60. Another is a BART car. Their site is worth a visit. 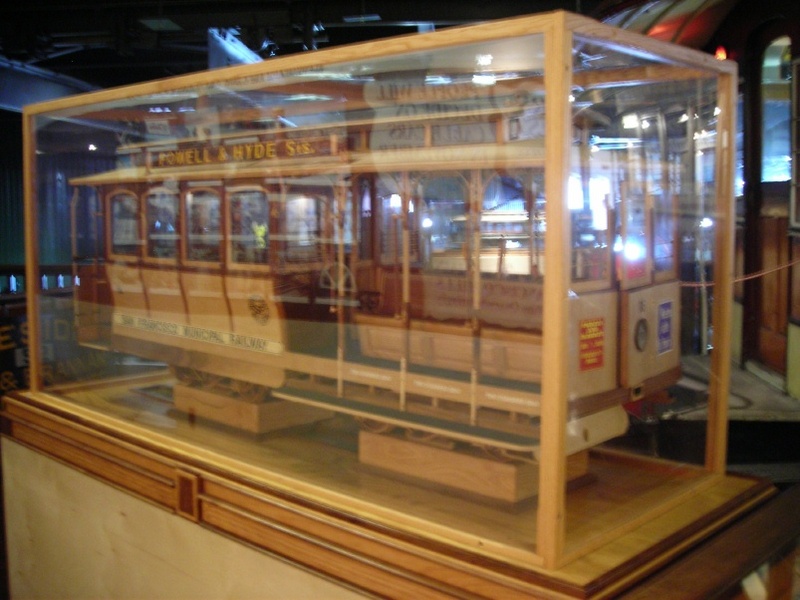 In August, 2008, the Cable Car Museum received the generous gift of a large wooden model of Powell Street Car 16. A modeller in upper New York State had built it. It was on display for some time at the Herbert Hoover Presidential Library and Museum in Iowa City, Iowa. The museum decided at some point that the model did not fit in with the theme of their collection, so they returned it to the artist. 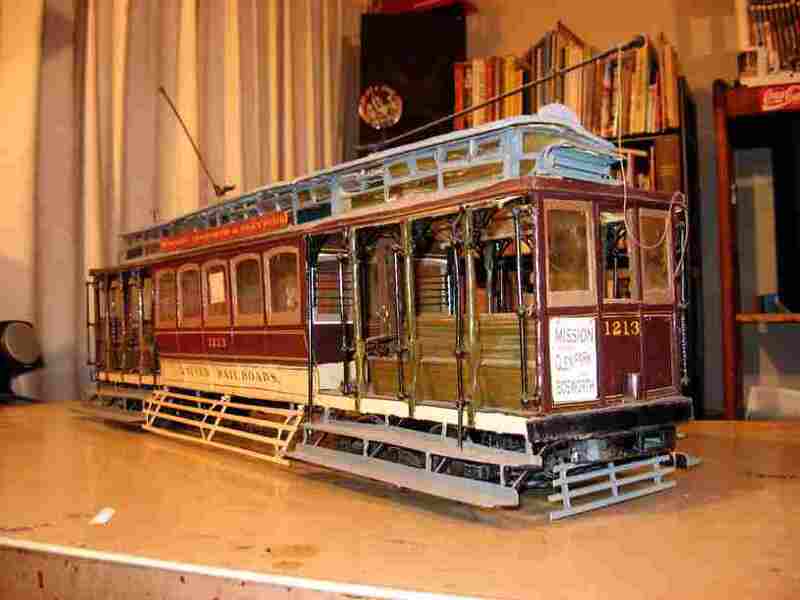 When the modeller died recently, his family donated the model to the Cable Car Museum. Val Lupiz wrote about the car's arrival in a recent edition of his Tales From the Grip, "Rookie Bites". 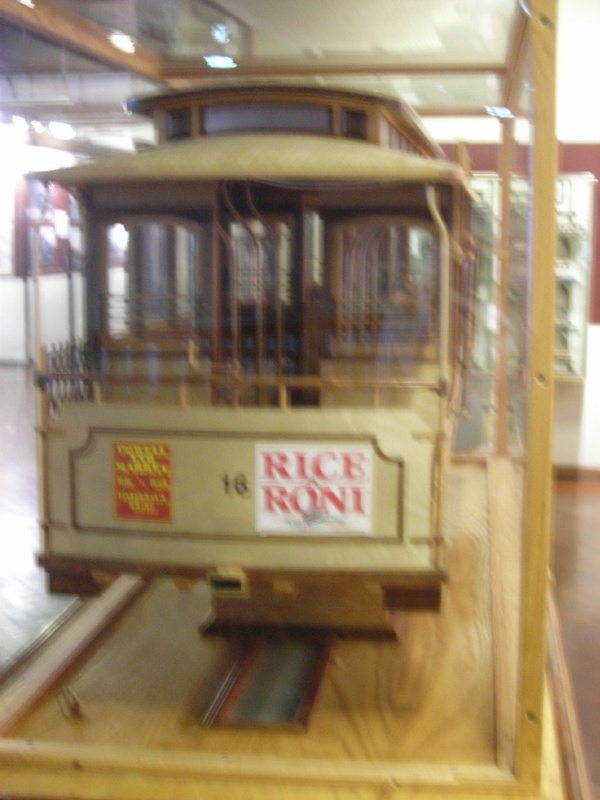 Model of Powell Street car 16 on display at the Cable Car Museum. 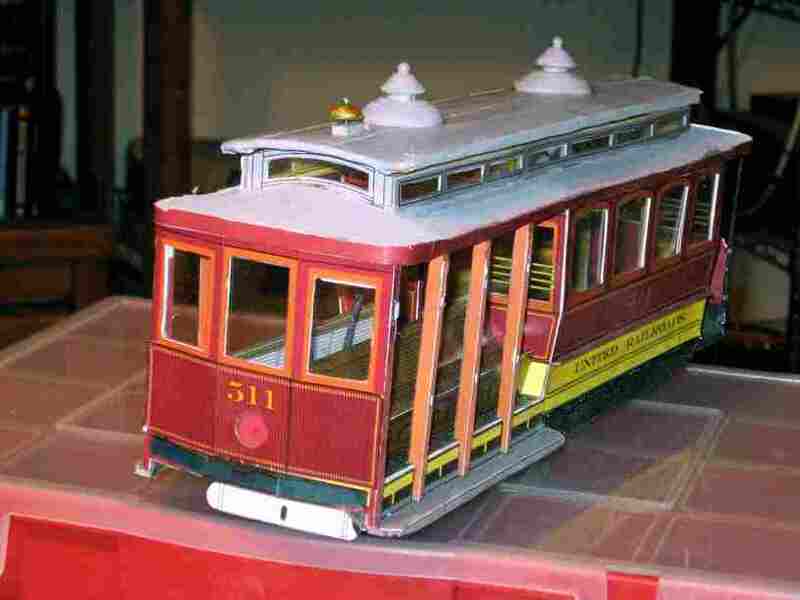 A front view of the model of Powell Street car 16 on display at the Cable Car Museum. 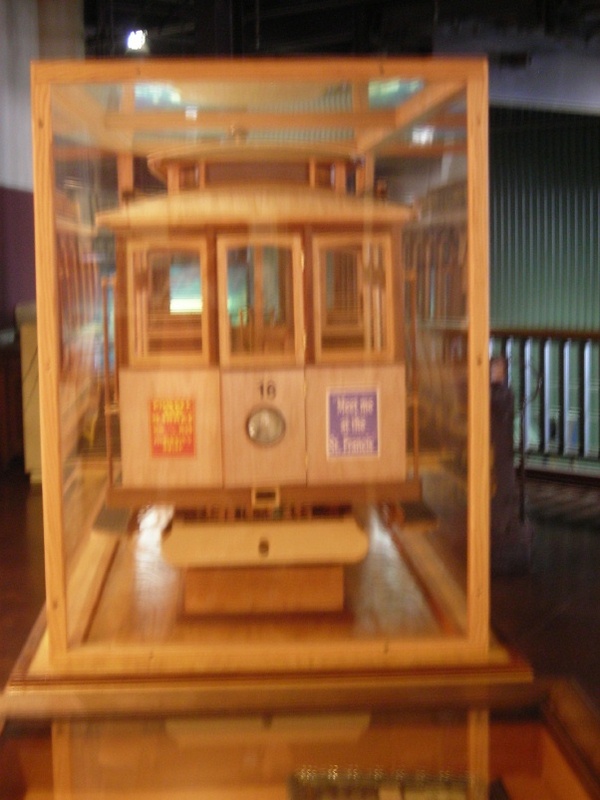 A rear view of the model of Powell Street car 16 on display at the Cable Car Museum. A virtual simulation is another form of model. 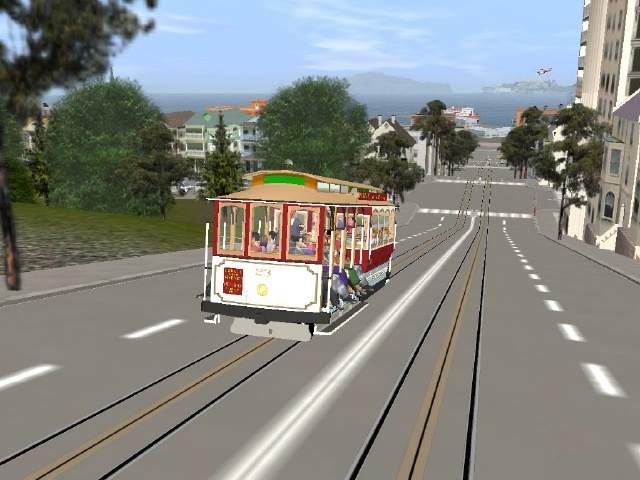 Norm Phythian, working from Australia, has created a Trainz simulation, referred to as a map, representing San Francisco's cable car lines. 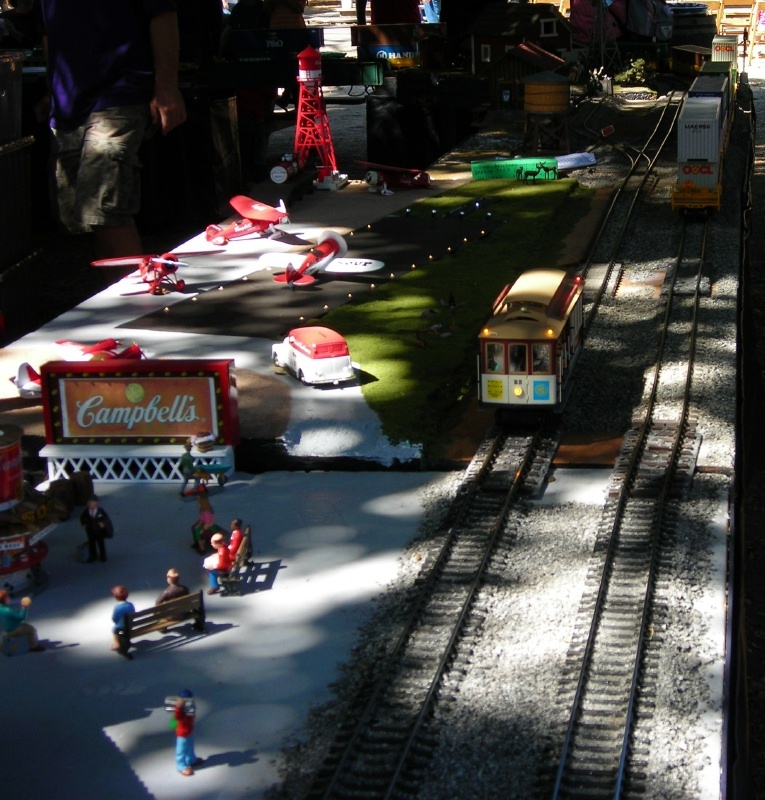 Sel Churchward has created representations the tracks and of cable cars to run on the lines. They both do nice work. A screen capture looking down Hyde Street from Norm Pythian's map. Car 23 by Sel Churchward. All rights reserved. Sel Churchward produced this version of Cal Cable 57. All rights reserved. #1 "Builtin assets" = those assets that come supplied with each version. #2 "Custom assets" = assets made by users and made available free for use. #3 "DLS" Download Station = a Library (or Warehouse if you like) for Custom assets, users download free after registering a copy of Trainz with Auran, you can only download assets suitable for the Version/s YOU have registered, assets made for newer versions cannot be used with older versions. #4 "C M" Content manager = a program to control custom assets. #5 "CMP" Content Manager Plus = an advanced version of content manager with tougher controls. 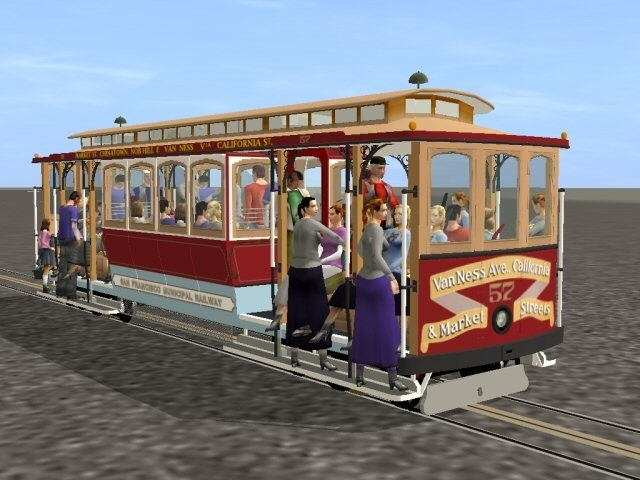 All versions of "Trainz" up to and including 2004 version, used "C M' and were very tolerant of errors in Custom assets. This means that hidden errors can show up in more recent versions of Trainz, though the models usually function correctly. Each version may have required a patch or two to correct little "bugs" in the program. All games and/or comp programs require them from time to time, and each new version was an improvement on the previous one, with additional features and functionallity. At the time ver 2004 was released the "DLS" contained approximately 70,000 custom assets. The 2006 version was released WITHOUT some of the "Builtin content" from previous versions and also included the new "CMP". Herein lies some of our problems, as some of the custom content was made to include some "Builtins" now NO longer available, for example an Engine would need a Builtin Bogey Truck, now missing. Maps would be missing content, only available in previous versions, missing ground textures are very obvious. The New "CMP" would reject these (and others with errors) as faulty, althought often they would function on the new version, at other times, the models need some editing by the user. In extreme cases, the original creator (if available) would need to make corrections. When the "TRAINZ Classic" range "TC 1&2" became available AURAN had changed tack to make these versions as special and only include a few New Maps and only the "built in" assets required for these maps. The TC 3 version had new maps, that did not include "builtins" from "1&2". While Auran had intended to have TC3 patch over the previous TC1 and 2 versions, so all content would be available, the patch did not work - long winded story isn't it. If they, (Auran) had made this version an update only, as they originally intended, then it would have been great, as the Graphics were a vast improvment over other versions. AURAN are now developing TRS 2009 version. No firm date for release announced yet, and the DLS now contains about 95,000 assets. After all that my conclusions are that TRS2004 is the most user friendly version for beginners who just drive trains, then "try" to make maps for themselves. The 2006 version is best (perhaps ?) for the more experienced user, or new user who has not had other earlier versions. Some model creators find the additional error checking useful, and some new TRS2006 functions are useful. The above are my own personal thoughts and comments as a registered user of all versions. I have seen some nice Garden Scale cable cars, but I don't know who made them. 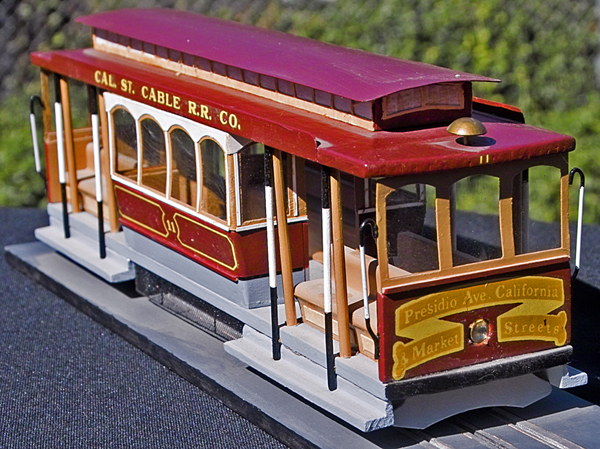 Powell Street cable car 26 runs by the airport on the Bay Area Garden Railways Association's G-gauge layout at Ardenwood Farm. September, 2006. 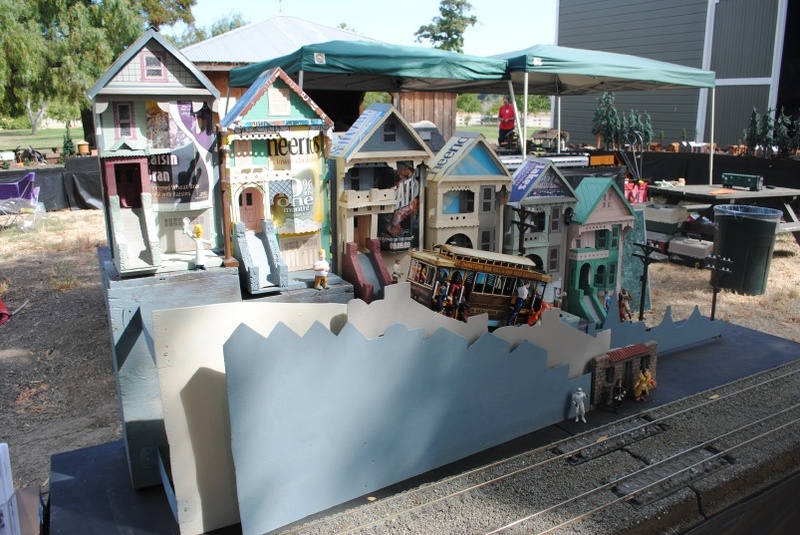 On Labor Day Weekend every year, the Society for the Preservation of Carter Railroad Resources holds the Washington Township Railroad Fair at Ardenwood Historic Farm, just across the Dumbarton Bridge in Fremont. 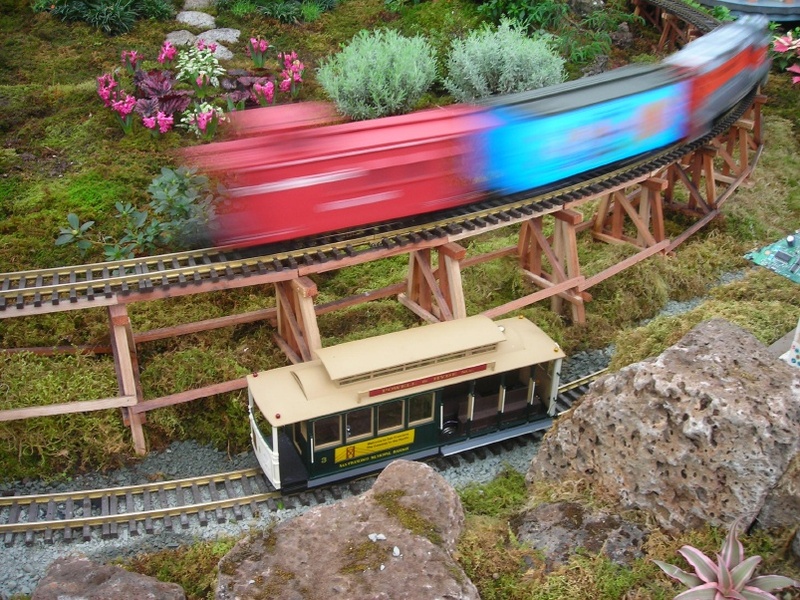 The Bay Area Garden Railways Association always brings a nice layout. Read more about it on my Park Trains and Tourist Trains site. Cable car 23 on the garden-scale layout. Note the sign advertising the 22nd Annual National Garden Railway Convention. September, 2007. 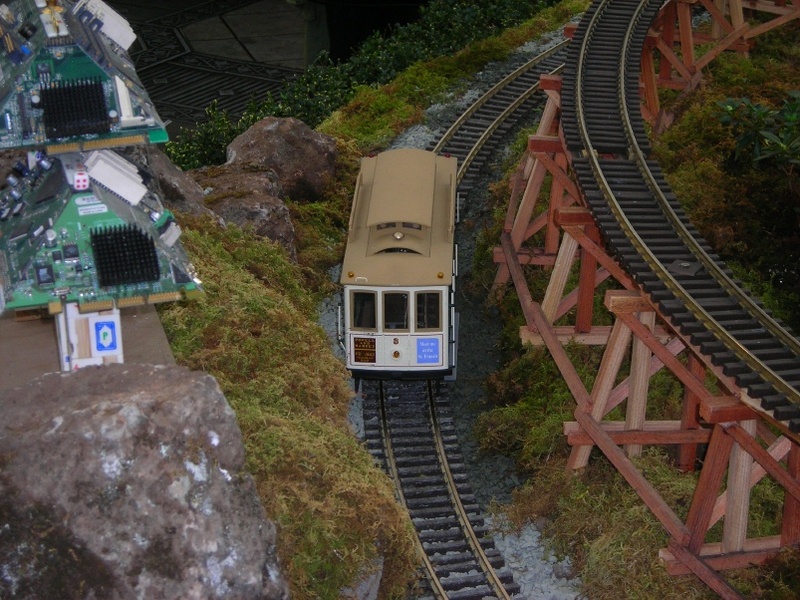 A static diorama at the 2011 Garden Scale layout has a California Street cable car on a hill next to some nice Victorians made from cereal boxes. September, 2011. 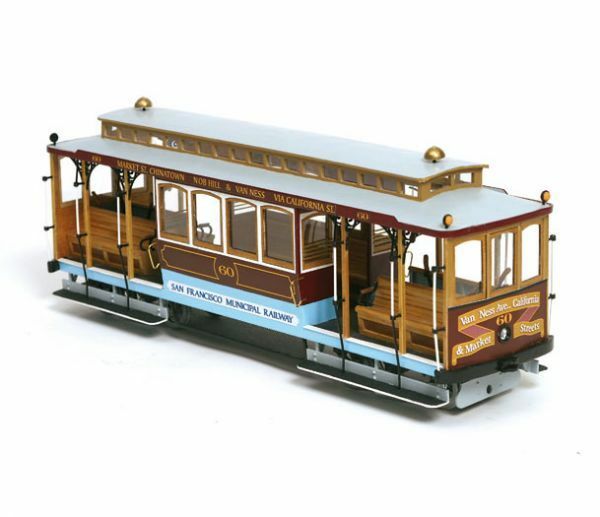 Powell/Hyde cable car 3, part of the Golden Gate Express Railway layout, runs down the Hyde Street Hill between Lombard Street and a row of Victorian houses. Coit Tower looms above. January, 2010. 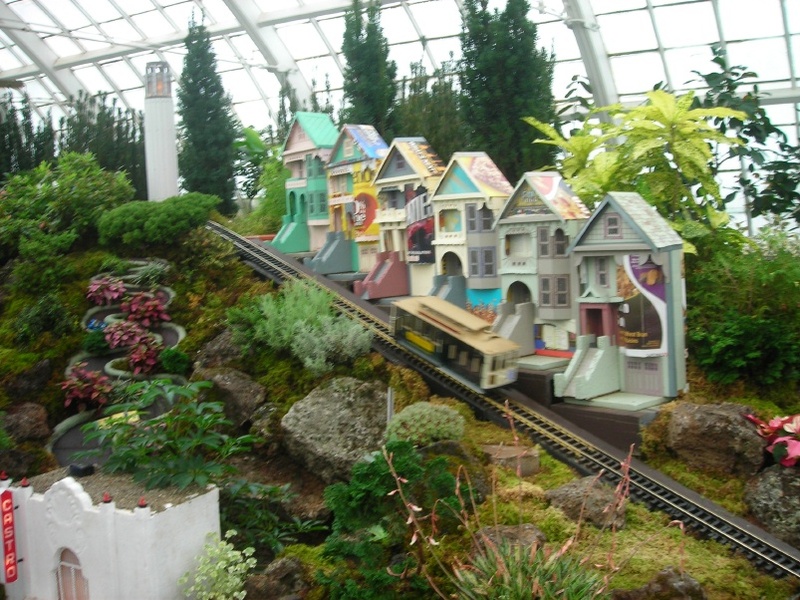 The Bay Area Garden Railway Society has taken over the special exhibit room in the Conservatory of Flowers in Golden Gate Park to set up the Golden Gate Express Railway, a garden scale layout with famous San Francisco structures made from recycled materials. In 2010, it featured a cable car running down the Hyde Street Hill. Unfortunately, it climbed the hill backwards. I couldn't bring myself to take a picture of that. Read more about it on my Park Trains and Tourist Trains site. Powell/Hyde cable car 3 waits at the end of the line after a downhill run. January, 2010. Powell/Hyde cable car 3 lays over at the end of its run. The freight train speeds by on a trestle in the background. January, 2010. Copyright 2005-2016 by Joe Thompson. All rights reserved.